My good friend Cotton said , “All there is to cowboyinʼ is ridinʼ and ropinʼ”. Ropes have quite a reputation, both good and bad. They have been around long enough to have survived lots of opinions. They are a tool, just like a gun, or a feed sack, all of which require discretion, and can be easily abused. The young are eager to lead the chase and see how much excitement can be had with a thousand pounds of horse and equal that in a hard running cow brute over uncertain ground filled with various hard and sharp objects. None of these enter into the consideration of the young ropers dreams of being the one who singlehandedly captures this wild creature roaming the ranch loose with no respect for man and horse. After surviving several good ropinʼ wrecks, good Lord willing, the young eager roper, becomes a seasoned hand. Not all reach this point for several reasons, but the fortunate develop a style that fits his needs, depending on the terrain, his older mentors, guiding influences, personal desires and time to practice his new found art form. The young seldom appreciate watching a veteran play their catch as if it was a thousand pound marlin on ten pound test line and land him without a scratch. The fun and excitement is mostly in the chase and the work usually begins once you realize you have captured this beast and you have to figure out what you are going to do with it next. This next step separates the cowboy from the contest ropers, how do you make a profitable situation out of this exhilarating situation. You will never see a cow brute wearing a watch. The captured beast seldom share your feelings of accomplishment and never willing to make the next step to becoming docile individuals of the animal husbandry occupation. This always separate the inexperienced from the experienced. Journals could be written about this step alone, but none would replace the necessity to accomplish this feat for the sake of profitability. You have to figure out how to put and keep this bovine individual in the productive cycle. Rope horses are made because of the same reasons and Mr. Equine always appreciates good sound reasoning with his training methods. It doesnʼt take him long to figure out the serious situation from a faint hearted try. Some people and horses alike donʼt need to make a half-hearted stab at this most serious event. The best rope horses are made because of a good physical and mental make-up first, lots of genuine reasoning, repeatedly exposed, and one serious cowboy, and serious cowboys love a good horse. So enjoy the chase, swing big and throw hard. 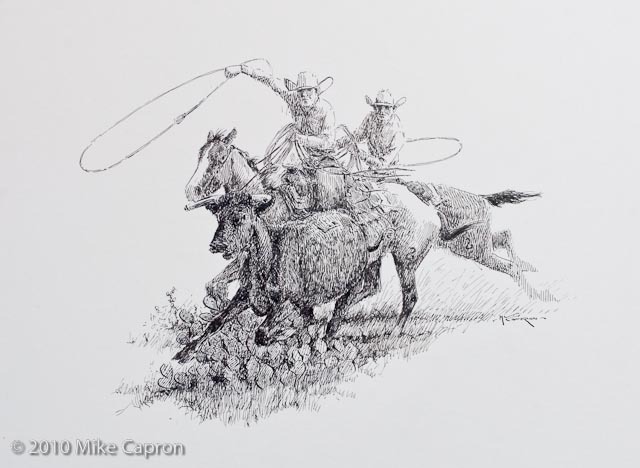 Comments for "Ropes, Ropers and Rope Horses"
charlie russell once said….ropes go on , guns go off…. Adding to Etienne’s comment, Mike Capron’s art is the new age of Charles Russel and Will James. Very detailed and precise from his years working with horse and cattle.